Sister J. Elizabeth "Betsy" Van Deusen, CSJ, has had enough careers for several people - and she's still just about the youngest jubilarian among the Sisters of St. Joseph in the Albany Diocese. This year she's celebrating her 25th anniversary of religious life. 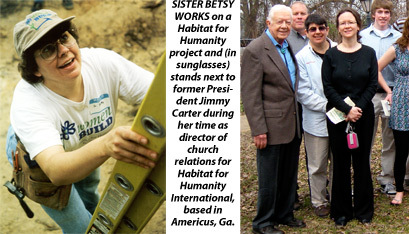 Sister Betsy has been in campus ministry, done disaster case management, headed Habitat for Humanity, led the St. Joseph Worker program and traveled around the world. When she looked back on taking her religious vows in 1992, however, she remembered being scared. As a 25-year-old woman, Sister Betsy saw the vows as limitations and challenges. Now, at 53, "the vows, for me, are a blessing and a gift," she said. "I've come to know the vows as opportunities for blessings. "We take three vows: poverty, chastity and obedience. I feel like they are freedoms." By living out her vow of poverty, she explained, she is not "owned by" possessions. Obedience to God strengthens her religious life, and she is able to love freely by living chastely. Sister Betsy encountered the Sisters of St. Joseph of Carondelet when she was in high school in Cobleskill. A parishioner of St. Vincent de Paul Church there, she had a feeling that religious life was for her. But she decided to go to college and live her life, following advice that, if she had "the call," it would still be there after she finished her education. College was "wonderful," Sister Betsy said, and she didn't put much thought into religious life. After graduating from The College of Saint Rose in Albany in 1984 with a bachelor's degree in sociology and religious studies, the young woman worked at a bookstore and, later, at Unity House in Troy. Unity House serves people struggling with poverty, mental illness, HIV/AIDS, domestic violence and more. "I had a great life," Sister Betsy told The Evangelist. But "I just kept getting the sense that something was missing." The call was still there. She joined the Sisters of St. Joseph. Her mother initially worried that she was "throwing her life away," but both her parents came to accept her vocation and celebrated with her after she took her vows. Today, Sister Betsy speaks of the "unfolding of God." First, she headed St. John's/St. Ann's Center in Albany, which offers food and other aid for people in need. In 1997, on her 35th birthday, she became the director of church relations for Habitat for Humanity International, based in Americus, Ga.
She was the first Catholic nun ever to hold that position. "Housing is just such an incredible need in our world," she said in an interview with The Evangelist after she accepted the position. "When people have the opportunity to own something, it changes people's lives." The department was cut after the events of Sept. 11, 2001, terrorist attacks on the U.S., sending Sister Betsy back home to the Diocese of Albany. 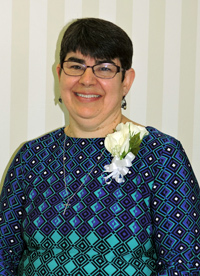 She worked at St. Helen's parish (now St. Kateri Tekakwitha) in Schenectady, serving variously as pastoral associate for youth ministry and for evangelization, then took on leadership of the St. Joseph Worker program in Schenectady, a volunteer program for young women. After Tropical Storms Irene and Lee hit in 2011, ravaging parts of six counties in the Diocese, Sister Betsy spent a year helping people rebuild their lives as a disaster case manager for Catholic Charities. Since 2013, she's been director of community partnerships for diocesan Catholic Charities. "I don't really have a typical day," she said of her current job. She wears many hats: jail ministry, managing volunteers at coat drives, making deliveries to local shelters and food pantries and other duties. "A lot of my work is asking people to do what they do," Sister Betsy explained. She recruited a construction company to install a kitchen at the Sunnyside Center for children in Troy, for instance. One of her current tasks is seeking seamstresses to cut donated king-sized quilts in half to fit the twin beds at area shelters. Sister Betsy said her work allows her to live out her vocation every day, from how she drives in the parking lot of the diocesan Pastoral Center to how she greets people in the hallways. "It's all connected," she told The Evangelist, and helps her balance spirituality, exercise, relationships and work. Sister Betsy has studied centering prayer, meditating silently on a single word or thought. "That has shaped everything in my life," she said. "Having a spiritual practice is necessary in today's life." After a quarter-century as a sister, she hopes she regularly encourages people to experience joy. "Time has marched on very quickly," she mused. "I used to be able to say I was 'Betsy' long before I was 'Sister.' That's not true anymore!"